This is without doubt a five star, standout book, though there are a couple of provisos that mean it won’t work for everyone. If you ask someone who has read a bit of popular science about the founders of quantum theory they will mention names like Planck, Bohr, Schrödinger and Heisenberg – but as Douglas Stone points out, the most significant name in laying the foundations of quantum physics was its arch-critic, Albert Einstein. You may be aware that Einstein took Planck’s original speculation about quantised energy and turned it into a description of the action of real particles in his 1905 paper photoelectric effect that won him his Nobel Prize – but what is shocking to learn is just how much further Einstein went, producing a whole string of papers that made the development of quantum theory almost inevitable. It was Einstein, for instance, who came up the earliest form of wave/particle duality. I have never read anything that gave detail on this fascinating period of the development of physics the way that Stone does. This isn’t really a scientific biography. Stone does dip into Einstein’s life, but often in a fairly shallow way. What is much more significant is the way he shows us the building blocks that would make the full quantum theory being put in place. It really is absolutely fascinating. Science writers like me tend to skip over large chunks of the way this developed, throwing in just the highlights, but Stone really gives us chapter and verse, without ever resorting to mathematics, demonstrating the route to quantum theory in a way, he suggests, that most working physicists have no ability to appreciate. Remarkable. I have two provisos. A minor one is that Stone’s context is not as well-researched as his physics. We are told that Arrhenius moved to Europe from Sweden, perhaps a slight surprise for most Swedes to realise that they don’t live in Europe. And he calls Rutherford British – admittedly the great New Zealand physicist did most of his best work in the UK, but I’m not sure we can count him as our own. The bigger warning is that this book isn’t going to work for everyone. 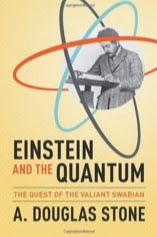 While I found some of the explanations – notably of a Bose Einstein condensate – the clearest I’ve ever read, Stone does fall into the typical trap of the physicist-as-science-writer of assuming what comes naturally to him is equally accessible to the general reader. I don’t think he makes clear enough the basis in thermodynamics of the early work, perhaps assuming that the statistical mechanics of vibrating bodies, and other essentials that constantly turn up in the early workings, are sufficiently straightforward as classical physics that they don’t need much explanation. Without that clear foundation, his later explanations may be slightly hard going – but I can only say that if you really want a feel for where quantum physics came from to persevere and go with the flow, because it is well worth it. P.S. I wish someone had told the cover designer how inappropriate the solar system-like atom picture on the cover is for the topic! From Wikipedia: "Ernest Rutherford, 1st Baron Rutherford of Nelson, OM FRS (30 August 1871 – 19 October 1937) was a New Zealand-born British physicist who became known as the father of nuclear physics"
Hint: Wikipedia isn't always right. To call Rutherford British is imperialist at best.